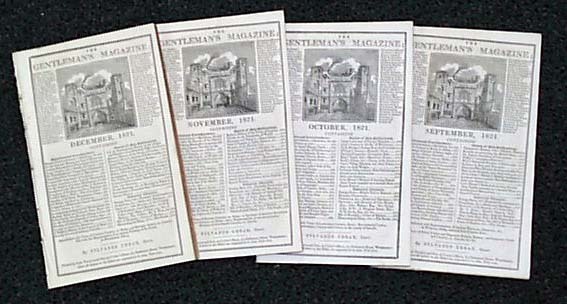 Item # 207492 THE GENTLEMAN'S MAGAZINE, London, England. This magazine is dated in the 1820's and contains about 56 pages. The front page has a nice engraving of St. John's Gate. The issue contains news & articles from around the world and is in nice condition. A nice period item form the 19th century. Please note - the issue you will receive will be dated from the 1820's, and will be similar to the issues shown in the image.